Blending passion with expertise, Chocolate Passion will become a chocolate lover's instant favorite. Fifty-four luscious new recipes developed and tested by editors at Chocolatier magazine celebrate chocolate at its best. Chocolate Passion presents information on chocolate making; ingredient, equipment, technique definitions, tempering instructions, comprehensive notes on chocolate and suppliers. 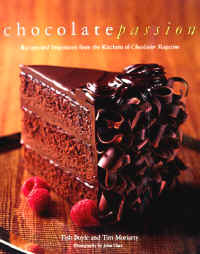 With 54 luscious recipes Chocolate Passion is definitely a Chocoholic dream come true. Throughout its three-thousand-year history, chocolate has deeply affected the soul, psyche, and international economics of mankind. Though no longer used as currency, bartering for part of a candy bar is still a common occurrence in school yards all over America. It was Nick Malgieri's first taste of an orange-flavored white chocolate candy bar given to him at age five by his father that began his life-long obsession with chocolate, and it initiated more than 45 years of research that has resulted in Chocolate - from simple Cookies to extravagant Showstoppers. As director of the baking program at Peter Kump's New York Cooking School, a traveling cooking school teacher and a regular substitute host on TVFN's "Cooking Live," Malgieri never stops sharing his culinary knowledge; encouraging both students and home bakers, and spreading his passion for chocolate. 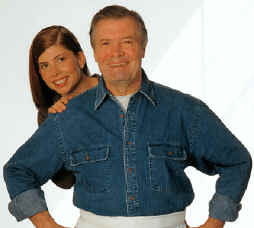 Culinary impresario Jacques Pepin and his spirited daughter Claudine have returned to the kitchen to share their philosophy on food and its power to bring friends and family together in their new book, Jacques Pepin's Kitchen - Encore with Claudine. The companion book to the second season of their popular public television series contains more than 110 original recipes, which Jacques uses to teach Claudine lessons in economy and resourcefulness, creativity, and versatility. Jacques' attention to the realities of cooking in today's time- and health-conscious lifestyles ensures lessons that last. Trained in classic cuisine, Jacques has served as personal chef to three French heads of state. But his menus' ethnic flavors, ease of preparation, and economy of time and money also make Jacques a chef for modern times. Creme brulee, cassoulet, and spinach souffle--healthy French dishes? Now they are, thanks to four of America's most famous French chefs: Jacques Pepin, Alain Sailhac, Andre Soltner, and Jacques Torres. In their first-time-ever book collaboration, The French Culinary Institute's Salute to Healthy Cooking, these four Frenchmen share the secrets of their native cuisine and 40 seasonal "French" menus that are guaranteed to help keep the body healthy and the savory senses satisfied. Individually, Pepin, Sailhac, Soltner, and Torres have contributed significantly to the evolution of contemporary French cuisine. 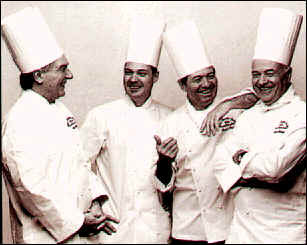 Collectively, their boundless artistry, expertise, and guidance are responsible for a "French revolution" in cooking. Whether cooking in the legendary kitchens of Le Cirque and Lutece or teaching in the classroom at The French Culinary Institute, these four chefs know that the days of vegetables marinated in butter and meats blanketed in rich cream sauces are passe.